Remember the backlash over the casting of actress Noma Dumezweni as Hermione Granger in Harry Potter and the Cursed Child back in 2015? At the time, a number of Potterheads (aka, the racist ones) struggled with the idea of a black Hermione in the theatre production, and complained the character should have been white, despite J.K Rowling never specifying the character’s ethnicity. Thankfully, opinion seems to have shifted, or maybe the bigots have finally realised that magic is for everyone. 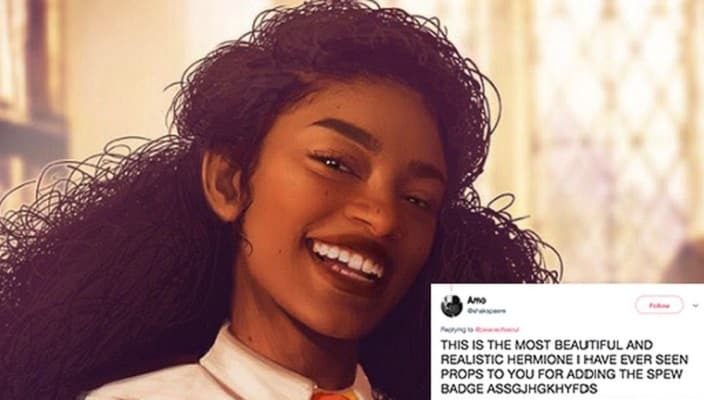 Either way, when artist Sophia Canning poster her painting of Hermione as a black woman to Twitter, the internet went crazy over it for all the right reasons. Digitally painted in Photoshop, the portrait was inspired by model and YouTube star Jasmine Brown, and it’s just plain stunning. I bet @jk_rowling would love your Work! Sis even put thought into the title of the books she’s reading. ????? LOVE this!! ❤️ My first instinct was to zoom in to check which books she was holding ?? Gorgeous pictur, you’re very talented!! It’s good to know that Hermione is an inclusive character that all little girls can look up to! I love the Emma Watson version, I love the book version, I love the full on black Hermione fanart version. For more of Sophia’s amazing artwork, visit her website. How Did We Never Notice This Huge Harry Potter Plot Hole? Oh No, Not a Harry Potter Remake!